The Odyssey orbiter has been hovering above Mars, photographing its surface and taking data for 16 years now. There’s seemingly infinite combinations of things to study and instruments to study them with—this time, all NASA had to do was turn the camera around. 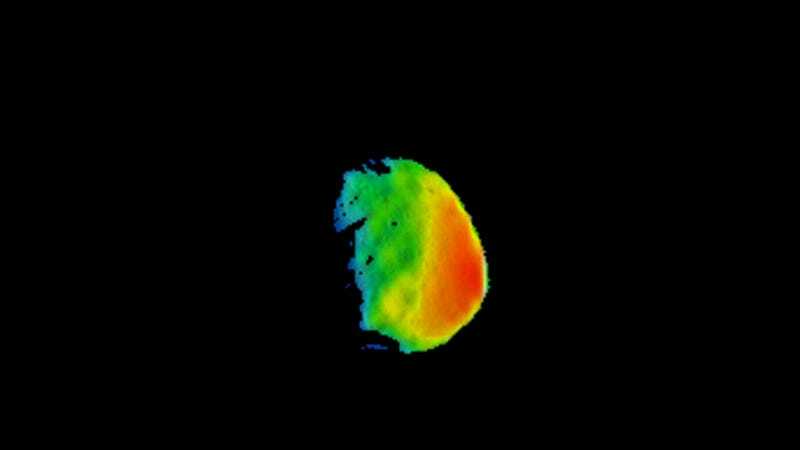 Odyssey snapped its first photos of the tiny Martian moon, Phobos, with its Thermal Emission Imaging System (THEMIS) on September 29th. The moon is only 14 miles in diameter (around the width of Washington D.C.), and the images were taken from a distance of around 3,500 miles, the distance from New York to London. You might be confused as to why this is news, since other orbiters like the Mars Reconnaissance Orbiter have taken snapshots of Phobos before. This is the first time Odyssey specifically has taken a peek at the moon, and the first infrared imaging available. Odyssey normally looks at Mars with THEMIS, since the planet is only about 250 miles below. Normally, the orbiter works on its main goals—understanding the geology of the red planet, its water activity and whether it has or ever had life. But, according to a NASA statement, scientists only recently developed the maneuver to actually turn the orbiter upwards at the moon, which orbits at an altitude of 3,700 miles. As a thermal imager, THEMIS, takes surface temperature information. This is important for studying space stuff: Understanding how things heat and cool under sunlight could help researchers figure out what things like Phobos are made of, and therefore their origin story. It’s like trying to figure out what a stovetop pan is made of based on how quickly it cools. Mars’ moons are weird. They’re tiny, pathetic potatoes compared to moons like ours or Titan, Saturn’s moon that’s bigger than even planet Mercury. But some scientists think that once in the planet’s past, it had a ring system like Saturns’ that coalesced into moons—and will one day turn into rings again. After all, Phobos is literally falling apart. The universe is full of new things to study. But sometimes you just gotta turn around first.